If you want to bring the feel of the islands to your backyard or a corner of your living room, learn how to build your own tiki bar. Tiki bars can be the life of a party, or liven up an average evening at home. First, you need to choose a location. For an indoor tiki bar, a corner of your dining or living room is an appropriate choice. Consider the spaces in which you typically entertain. Also, take into account how the tiki aesthetic will mesh with your current design scheme. If you prefer to locate your tiki bar outdoors, find a clear space that is as flat as possible; a patio would be ideal. Locate your tiki bar against a fence or wall to anchor the bar or it can be freestanding. Before you get to work, determine the dimensions for your bar. Make a rough sketch as a guide. While the size of your bar will depend on the space available, as a rule of thumb bars are generally 42 inches high (higher than an average table), and around two feet deep. The width can range from four to eight feet.Using 2x4s construct the frame for your bar. Cover the top, front and sides with sheets of plywood, which you will nail to the framing. While plywood isn't attractive, it is inexpensive and you will be covering these surfaces anyway. For your bar surface, attach a piece of veneered plywood so it will be water resistant. Cut this piece so that it overhangs the bar base by two or three inches on all sides. Next, nail bamboo fencing to cover the front and sides of the bar for that authentic, tiki look. Purchase bamboo fencing online or at your local home improvement store. An easier option is to use bamboo blinds. If you want to save time while building your tiki bar, you can use a tall table or an old bar instead of constructing your own. Since you will cover it with bamboo fencing, no one will know the difference. The roof is what really gives the tiki bar its iconic form. A true tiki bar would have a Polynesian thatched roof, but most people don't possess thatching skills. An easier but still festive alternative is to build a simple sloped plywood roof covered in palm fronds. Support your roof with two or four bamboo poles, depending on the size of your bar. You can drive the poles into the ground, or cut openings in your bar top to conceal the bases. Construct a simple frame extending between the poles, and reaching out to brace the roof. Attach two sheets of plywood to the frame to form the pitch of the roof. Staple thatching or palm fronds to the plywood and conceal it entirely. Purchase thatching online or from a local nursery. If you are concerned about it shedding or blowing away, cover the thatching material with fine netting. If your tiki bar is indoors, you probably don't have the available height to build a roof, nor do you really need one. Instead, string tiki bar raffia fringe above your bar. No tiki bar is complete without a few decorative items and the right barware. You can find these items at your local party store or online. If you don't have time to build your own tiki bar or aren't up for the challenge of a do-it-yourself project, you might consider purchasing a ready-made tiki bar. However, you should expect to spend significantly more for a ready-made bar than building your own.There are also many books and ebooks with plans and detailed instructions to build a tiki bar, if you want to make an especially fancy tiki bar with a highly customized design. 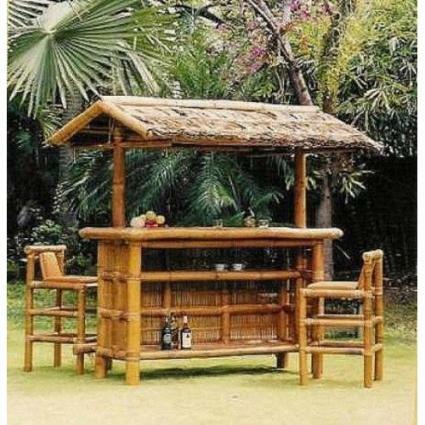 When building your own tiki bar, you can construct it from raw materials or take a few short cuts. Ultimately, tiki is all about the kitsch factor. Gather your supplies, and before you know it you will be lounging and sipping Mai Tais.